Buck Knives is an iconic American knife company that was founded by Hoyt Buck in 1902. The company has remained a family owned business for four generations and it produces a wide range of fishing, hunting, field and sporting knives. 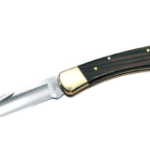 In 1964, Hoyt’s son Al Buck introduced the Model 110 folding hunter knife. 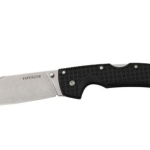 This knife revolutionized the industry due to its innovative folding locking system. The company has continued to innovate and impact the knife industry while maintaining the focus on tradition and quality production. Al Buck’s son Chuck is a well known and beloved member of the Buck family and business. He worked his way up to President and CEO and then handed that position over to his son. 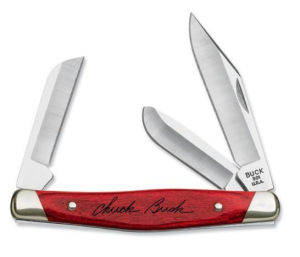 Chuck is currently the Chairman of the Buck Knives company. In his honor and with his endorsement, Buck Knives created a series of knives known as the Chairman Series. DymondWood is an engineered hardwood combined with resins, heat and pressure. The result is a handle that is distinguished by its upgraded strength, durability, dimensional stability, and weather and moisture resistance as compared to regular wood. The addition of the Chairman’s signature on the handle signifies his endorsement of the quality of each knife. The Buck Anvil Medallion is located on the handle and is on the opposite side of Chuck’s signature. This medallion is a visual representation of the workmanship, pride and tradition of the Buck family business. 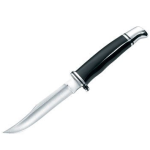 This is Buck’s signature contouring, nickel silver bolster that makes the knife more comfortable in the pocket or hand. The Chairman series includes a variety of knives from the popular 110 hunting knife to the 305 Lancer. The following review of several Chairman series knives demonstrates the range of knives available in the series. This is the classic 110 Folding Hunter knife that revolutionized the industry when it was introduced and it continues to be a top seller worldwide. It is equipped with all of the same features of the regular 110 and includes the special Chairman series features listed above. For a collector who knows the impact that the 110 Folding Hunter knife had on the industry, this unique Chairman Series edition knife would be an appreciated gift. 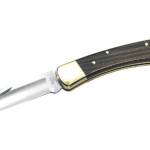 The largest three blade knife available from Buck, the 301 Stockman Chairman Series was created for multipurpose use. It contains a clip point blade, a splay blade and a sheepsfoot blade. Having all three blades in one tool means that this knife can effectively be used for everything from detail work to skinning with ease. The combination of size, versatility and the signature Chairman series features make this a knife that would be a great addition to any knife collection. This is a larger, slimline style knife with one blade. For those who are looking for a lighter weight knife and regularly only use one blade, this knife is a great option. The combination of durability, convenience and elegant Chairman Series details make this reasonably priced knife a great investment.